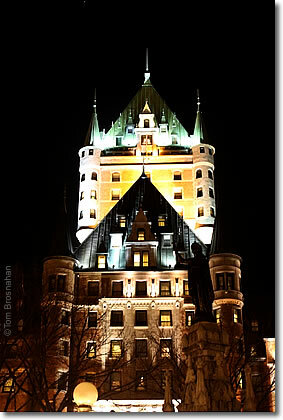 The grande dame of Québec City hotels has the premier location in the entire city. If you've seen any photo of Québec City, you've probably seen the palatial Hotel Le Chateau Frontenac perched at the tip of Cap Diamant overlooking the surging St Lawrence River, the choicest location in Québec City, and one of the finest in the world. Canadian Prime Minister Mackenzie King, US President Franklin D Roosevent and British Prime Minister Winston Churchill met here during World War II. Queen Elizabeth and Prince Philip have been guests, as have many other notables. You can stay here too. 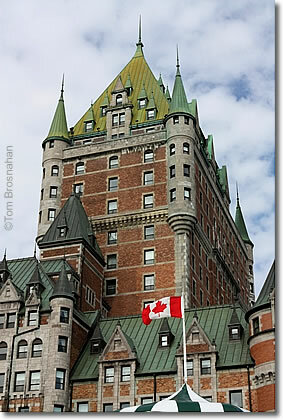 Le Chateau Frontenac offers a variety of rooms and prices. The advantages to staying here are many: prestige, fine views, convenient to both the upper and lower towns of Vieux Québec. The only disadvantage is that when you are in the hotel, you can't gaze at this symbol of the city. Above, Hotel Le Chateau Frontenac.